Appeal court makes rare finding of bias against judge BY NEIL ETIENNE Law Times I n a rare finding released Jan. 21, Justice David Corbett of the Superior Court of Justice was found to have shown a reasonable apprehension of bias. The Court of Appeal decision in Stuart Budd & Sons Ltd. v. IFS Vehicle Distributors ULC states IFS "did not receive the fair hearing to which they were entitled." "I have no doubt that the motion judge was well- intentioned. I have no doubt that he put a great deal of effort into resolving the jurisdiction issue," states the appeal court decision by Justice Gloria Epstein, with justices K.M. Weiler and Grant Huscroft agreeing. "However, my review of the three endorsements leads me to conclude that the motion judge's actions gave rise to a reasonable apprehension of bias. He made unwarranted negative comments about the appellants — their counsel, their position and their arguments — prior to the conclusion of argument and arbitrarily curtailed argument." Ultimately, the appeal court set aside Corbett's orders, including $50,000 in costs against IFS. The decision also ordered the joinder and forum non conveniens motion be heard again before a differ- ent justice of the Superior Court. Siskinds LLP partner Peter Dillon commented on the case, calling the finding of apprehension of bias extremely rare. He says the matter is a warning to lawyers to be on guard when things seem to be going too well, and to act as an officer of the court. 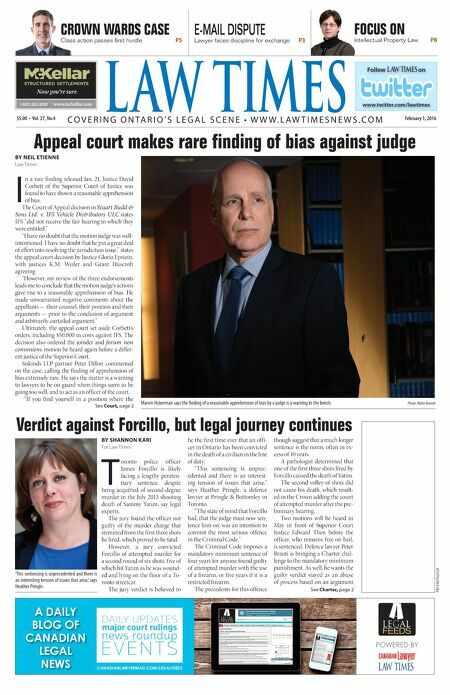 "If you find yourself in a position where the Verdict against Forcillo, but legal journey continues BY SHANNON KARI For Law Times T oronto police officer James Forcillo is likely facing a lengthy peniten- tiary sentence, despite being acquitted of second-degree murder in the July 2013 shooting death of Sammy Yatim, say legal experts. The jury found the officer not guilty of the murder charge that stemmed from the first three shots he fired, which proved to be fatal. However, a jury convicted Forcillo of attempted murder for a second round of six shots, five of which hit Yatim as he was wound- ed and lying on the f loor of a To- ronto streetcar. The jury verdict is believed to be the first time ever that an offi- cer in Ontario has been convicted in the death of a civilian in the line of duty. "This sentencing is unprec- edented and there is an interest- ing tension of issues that arise," says Heather Pringle, a defence lawyer at Pringle & Bottomley in Toronto. "The state of mind that Forcillo had, that the judge must now sen- tence him on, was an intention to commit the most serious offence in the Criminal Code." The Criminal Code imposes a mandatory minimum sentence of four years for anyone found guilty of attempted murder with the use of a firearm, or five years if it is a restricted firearm. The precedents for this offence though suggest that a much longer sentence is the norm, often in ex- cess of 10 years. A pathologist determined that one of the first three shots fired by Forcillo caused the death of Yatim. The second volley of shots did not cause his death, which result- ed in the Crown adding the count of attempted murder after the pre- liminary hearing. Two motions will be heard in May in front of Superior Court Justice Edward Then before the officer, who remains free on bail, is sentenced. Defence lawyer Peter Brauti is bringing a Charter chal- lenge to the mandatory minimum punishment. As well, he wants the guilty verdict stayed as an abuse of process based on an argument CROWN WARDS CASE Class action passes first hurdle P5 E-MAIL DISPUTE Lawyer faces discipline for exchange P3 FOCUS ON Intellectual Property Law P8 See Charter, page 2 PM #40762529 $5.00 • Vol. 27, No.4 February 1, 2016 L AW TIMES C O V E R I N G O N T A R I O ' S L E G A L S C E N E • W W W . L A W T I M E S N E W S . C O M Follow LAW TIMES on www.twitter.com/lawtimes Marvin Huberman says the finding of a reasonable apprehension of bias by a judge is a warning to the bench. Photo: Robin Kuniski A DAILY BLOG OF CANADIAN LEGAL NEWS FEEDS LEGAL POWERED BY CANADIANLAWYERMAG.COM/LEGALFEEDS FEEDS LEGAL POWERED BY LegalFeeds_LT_Dec1_14.indd 1 2014-11-26 9:44 AM & $#&!&jmmm$cYa[bbWh$Yec ntitled-4 1 12-03-20 10:44 AM See Court, page 2 'This sentencing is unprecedented and there is an interesting tension of issues that arise,' says Heather Pringle.